I have had this receiver for over 6 months now, and whilst not using it every day, I have used it enough to have an informed opinion of it’s pro’s and con’s. A quick description of the receiver for those who have not heard of it. The receiver is of an unusual design, more like a hand-held transceiver, measuring 53(W) X 159(H) X 26(D) mm. It naturally fits in the hand, with the thumb resting easily on the thumb-wheel tuning. The buttons on the front are for a number of alarm and display functions, SSB selection, and ETM, along with band selection and up/down keys. The inclusion of SSB makes this quite a unique radio, and certainly interesting to use when out and about. It is supplied with ear buds, faux leather carrying case, the plug-in MW bar, and instruction booklet. A manual is also available to download. As can be seen from the picture, the receiver sports a telescopic antenna for FM/SW, and a unique plug-in MW ferrite rod antenna, which is rotatable in its socket. Long Wave is also available and on mine was factory set to be included, but if not, it can be made available by the menu options. Like many of Tecsun’s latest receivers, the PL-365 includes the ETM function, which stands for Easy Tuning Mode. With this, you select the band (MW,FM,SW), press ETM, and it loads into a local memory, all the stations that it detects. These do not over-ride any of the main memory that may have been already used to store stations. It is specific ‘ETM’ memory. Once the detection process is completed, the tuning wheel is then used to select each of the stations detected. This is an extremely useful feature on this receiver, as it doesn’t have keypad entry for frequencies. And band scanning using the thumb wheel in 5 Khz steps can get tedious! Of course, ETM will have to be repeated a number of times during an extended listening period as stations come and go. My first port of call on starting the listening tests was FM, to judge how it received the local and national broadcasters, and to see how stereo broadcasts are received. Incidentally, I changed the supplied ear buds for some in-ear types which I find stay in place better. All national broadcasters (BBC) and local radio stations (BBC and independent) were detected well. Received audio on the built in speaker is pleasant, but as can imagined from such a small speaker, not of great range. However, stereo broadcasts from BBC Radio 3 (classical music) and Classic FM, sounded excellent using the ear buds. At night time, some further afield stations are detected, so the FM sensitivity is good. When I conducted these initial tests, it was evening so I decided to give the MW band a whirl as well. I fitted the MW bar antenna into it’s socket atop the receiver, selected MW and hit the ETM button. After a couple of minutes, the detection process stopped and a great number of stations had been detected. Going through them, not only were there the local (and not so local) UK MW stations, but some from much further afield such as Bretagne 5, SBC in Riyadh, and RNE Radio 5 in Madrid. By turning the ferrite antenna, it was possible to peak these stations nicely. So now to SW. As can be seen, SW coverage is full range from 1711 – 29999, excellent for a receiver of this price range. For this initial test, listening was carried out in the early evening, in the garden, during the summer, so the higher bands were where most of the action was. Following a similar pattern to the FM and MW test, the telescopic whip was extended and the ETM button pressed. On stopping detection, a total of 65 stations were noted. One or two of these, it later proved, were images, but for the most part they were all receivable signals. The treshold for detection is quite low, so some stations are barely audible under the noise, a testament to the sensitivity of the 365. All the major stations were received well, such as VOA on 15580, Saudia Arabia on a number of frequencies, CRI of course, over numerous frequencies. And in between, stations such as CNR1 (China National Radio), the regional Chinese service, and R Australia on 12065, BBC from Singapore. After this, I did some listening on the 20 and 40m ham bands. To do this is slightly tricky, as it entails coming out of ETM mode by pressing the VF/VM button. This puts the radio into frequency mode and the thumb wheel is then used to get to the correct frequency. The USB/LSB button is then pressed and once a station is found, press the BFO button. The tuning thumb then becomes a BFO fine tune, and the amateur radio station can be tuned in accurately. It is tricky to start with but you do get used to it and amateur stations can be tuned in well. I received a number of European stations on 40m and European/Asian ones on 20m. So again, sensitivity is good, even though this is just using the whip antenna. Over the months between those initial tests and now, I have done a number of hours listening using this radio, on both the MW and SW bands. I especially like it if I am out for a walk in the country near us as its handy to carry in the pocket. One Sunday I listened to the whole hour of a VOA broadcast on 15580, whilst wandering along the Lincolnshire foot paths. And it is also a nice radio to do a bit of casual listening from the armchair of an evening, when the TV is on but of no interest. This way I have enjoyed many a broadcast from VOA, RRI and the BBC using the ear buds. It’s also nice to tune into the Celtic music of Bretagne 5 during the evening on MW as a change from the fair on BBC Radio 2 or 3. Would I recommend this radio? Yes I would, whole heartedly. For what it is designed to do, it does very well. Could it be better? Of course. A keypad would be nice, an external antenna port would be great and so on. But it was designed to be a general coverage receiver, in a small, hand-held package, and for that it receives top marks. Many thanks for your review, Charlie! I agree with you that the PL-365 is ideal, in terms of form factor, for radio listening while on long walks and hikes! It is certainly an excellent portable. 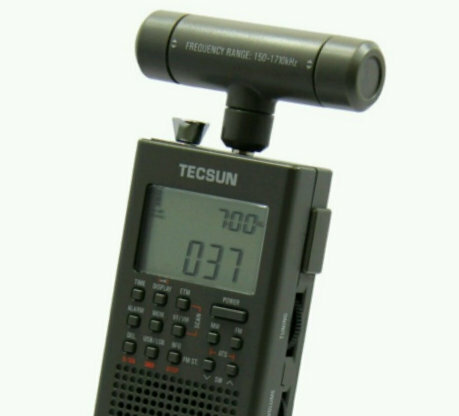 The Tecsun PL-365 can be purchased from Tecsun Radios Australia and occasionally on eBay (click here to search). This entry was posted in Guest Posts, News, Portable Radio, Radios, Reviews, Shortwave Radio and tagged Charlie Wardale, PL-365, Reviews, Shortwave Radio Reviews, Tecsun, Tecsun PL-365 on February 27, 2017 by Thomas. County Comm GP-5/SSB and Tecsun PL-365: a couple of years ago, I obtained a GP-5/SSB from Universal and have enjoyed using the radio. It’s extremely sensitive, often bringing in signals in the middle of my house here in Maryland, and is fun to use, provided the auto-tune is done to insert frequencies so you don’t have to use the thumb wheel too much. I have often thought that the next logical upgrade for this radio would be to add a small keypad to allow direct frequency selection, but perhaps that is not in the cards. The County Comm is basically the Tecsun PL-365, but the actual Tecsun version has not been available for the most part from major sellers, even from Anon-Co in Hong Kong, or Universal. You can still find some PL-365’s from certain Ebay sellers. Last year I obtained two from a Hong Kong seller. Both were NIB, and arrived within about a week or so of purchase. What I noticed immediately is that the PL-365 has a different kind of exterior surface, more rubberized than the County Comm. I was curious about any differences in performance that might be obvious. Recently, I took both outside for a very basic comparison — not scientific by any means, but I think it shows something that I have noticed. Both share the characteristics of extreme directionality, and sensitivity to touch — sensitivity increases markedly when they are hand-held, decreases noticeably when they are left standing on their own, or angled. I have noticed this when using them at the beach. If I am recording a station, and leave the radio alone for a few minutes, I return to find reception degraded quite a bit, because they were not being held. In my very basic comparison, I had both receivers next to each other on a backyard table, both antennas fully extended, full batteries on both. While on some frequencies, at least initially, it seems little difference can be heard, on others there is what seems to be greater clarity and signal separation on the PL-365. I noticed this from the start on 13.710 where the County Comm appears to be noisier than the PL-365, and on the portions later in the video when both are tuned to 11.820 (de-tuned to 11,818) Saudi Arabia, and to 11.945 khz. Apologies for the length of the video. 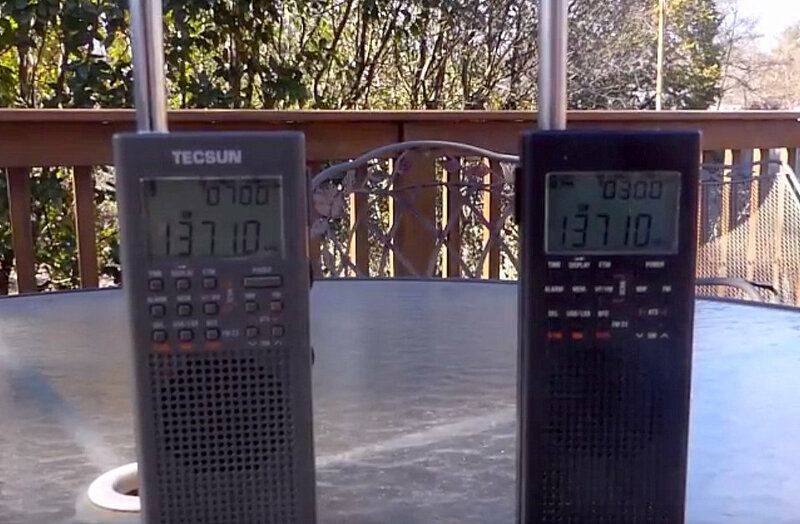 It’s hard to draw any conclusions based on this comparison, and I intend to do some additional tests with both my PL-365s and will report back on any findings, but I thought this would be of interest to those of you out there with these fine little radios. Thank you for this review and comparison, Dan. I’m often asked if there is any difference in performance to justify the extra costs typically associated with the PL-365. I can now share this video and your review–potential owners to draw their own conclusions. The Tecsun PL-365 can occasionally be purchased through sellers on eBay. The CountyComm GP5-SSB can be purchased from Universal Radio or CountyComm. This entry was posted in Guest Posts, News, Radios, Reviews, Shortwave Radio, Shortwave Radio Reviews and tagged CountyComm, CountyComm GP5-SSB, Dan Robinson, GP5-SSB, PL-365, Shortwave Radio Reviews, Tecsun, Tecsun PL-365, Tecsun PL-365 vs CountyComm GP5-SSB on February 5, 2017 by Thomas.